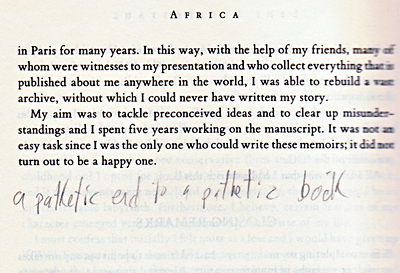 Discovered this in a public library copy of Leni Riefenstahl’s autobiography that I was reading for school. This person had written similar comments all throughout the book. In the end reading the previous readers running commentary was more interesting then the book itself. This the final comment on the last page was by far the best and I must be honest I kind of agreed with them by the time I had finished the book, too.